Welcome back Tudor enthusiasts! 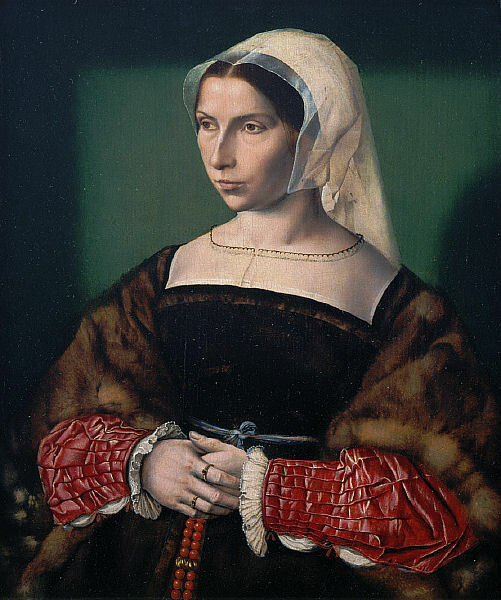 In my last post on Tudor weddings I talked about the headgear that women wore and how the aristocrats, especially the wives of King Henry VIII, set fashion trends. Today we’ll focus on the gowns that Tudor women wore. 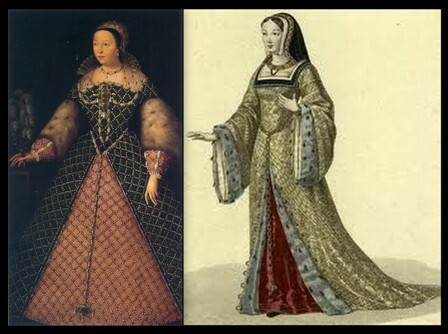 The dress of women in the Tudor period was similar in construction to gowns from the Medieval period. Dressing started with a chemise and petty coat (a type of slip), then a kirtle followed by a long gown that may be one piece or divided into skirt and bodice. What is new in the Tudor period is that the gowns now have sleeves attached to the shoulders unlike before when the sleeves you saw were the kirtle from underneath. At the beginning of the Tudor period waistlines were high,above the naval, marking the beginning of the triangular silhouette. 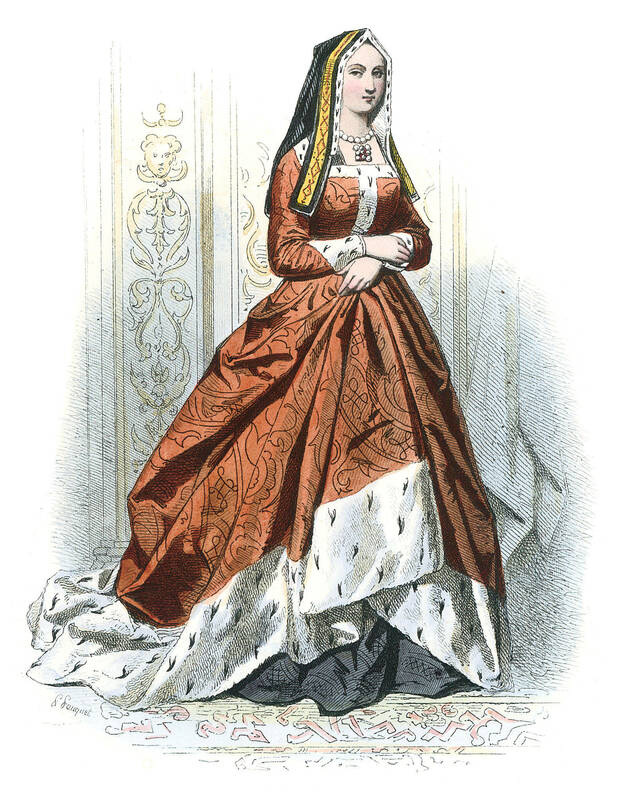 Below is an 1895 engraving of Elizabeth of York (1466-1503) showing the high waistline. Elizabeth of York was the daughter of Edward IV and Elizabeth Woodville, Queen consort to Henry VII and Mother of Henry VIII. As the decades passed the triangular silhouette became a cone silhouette as seen in the picture below of Catherine Parr (c 1545) 6th wife of Henry VIII. You will notice that the square neckline is still fashionable. These necklines were decorated with embroidery, beads, pearls and the like. Also, notice the front slit on this dress. This was common throughout the entire 16th century. The idea was to enjoy the lovely effect of layering created by an elaborate under-gown covered with a contrasting over-gown. Lady Jane Gray ~ Photo Source Wikipedia. 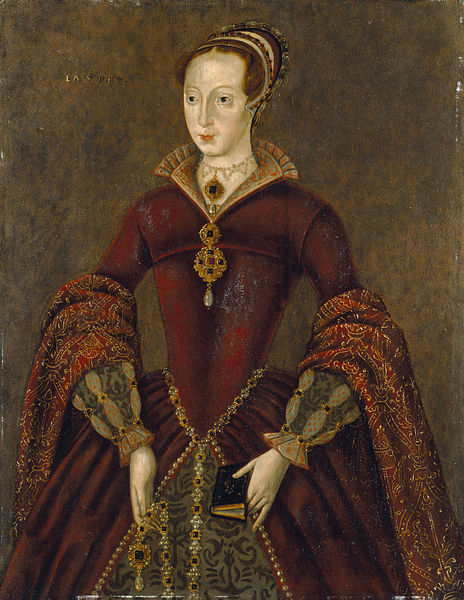 This photo was made in the 1590’s but depicts Lady Jane C. 1545-1550. In this time period there was something called the “sumptuary laws” or dress codes which stated that only people of certain rank could wear certain fabrics and colours. For example, a merchant could not wear purple velvet; only royalty could. Other colours that were prohibited for commoners to wear were: scarlet, blue, purple, gold. Some class restricted fabrics were satin, silk, wool from outside of England, velvet, fur, taffeta and damask. But that was then and this is now so feel free to wear! Sleeves changed rapidly during this time period. They started off narrow but over time grew puffy and with cuffed wrists. As well, sleeves became dis-attached from the gown and one could tie or pin them to the dress. It was in the latter part of this time period that two iconic fashion necessities came into use: the hoop skirt and the corset. The hoop skirt, at this time called a ‘farthingale’ was designed in such a way as to accent the natural form of a woman’s body and to hold the lower part of the dress or skirt in form. The farthingale, which originated in Spain, came to England when Catherine of Aragon married Prince Arthur in 1501. 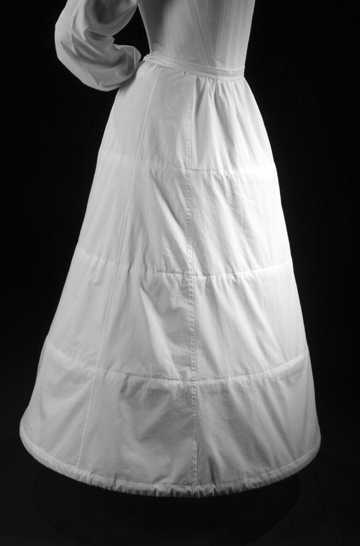 Farthingales were made from simple linen and bendable wood like willow. Below are some sites to help you make one. 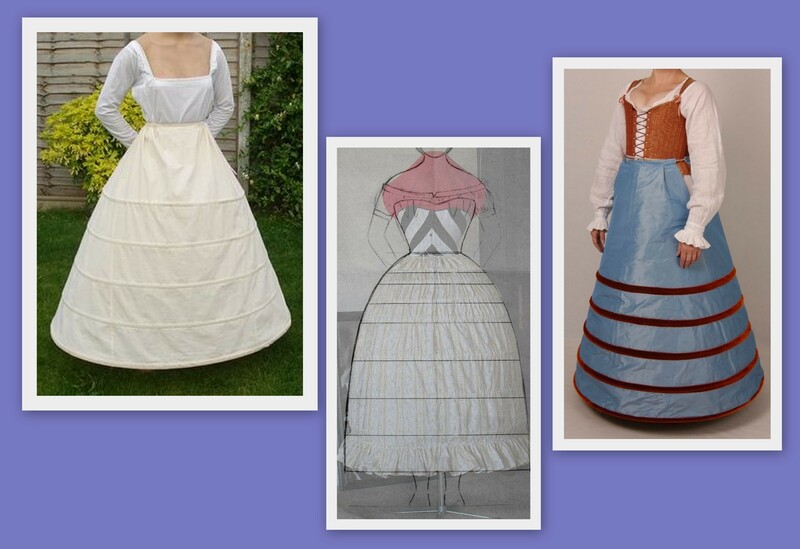 To purchase, goggle “hoop skirt” but make sure it’s not to elaborate or big or unnatural in shape as those belong to other time periods, not the Tudors. You might be wondering where on earth you might get such a gown. Below are some suggestions. The Very Merry Seamstress has fabulous reproductions at very reasonable prices. Below is a Jane Seymour dress. From Very Merry Seamstress. 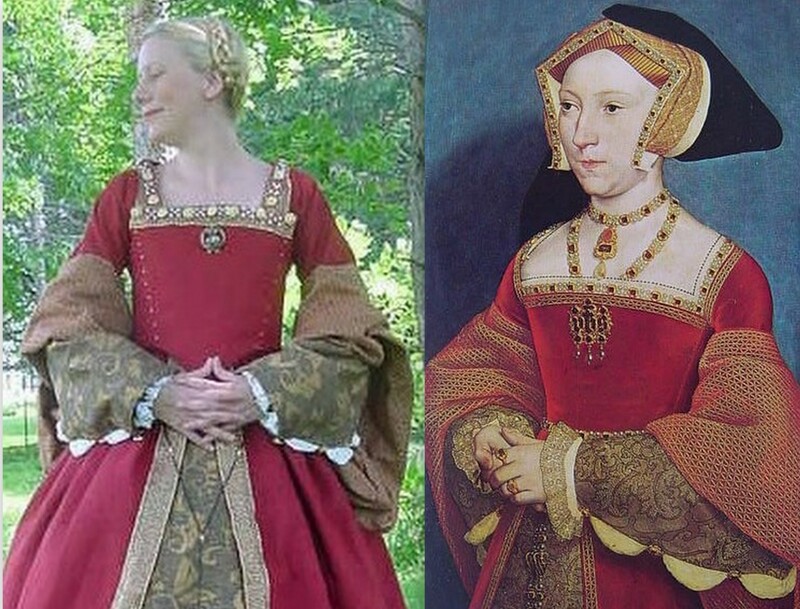 Portrait of Jane Seymour on right with reproduction of her dress on left. There are many vendors on Etsy who produce Tudor style dresses and accessories. French Hood from The Tudor Tailor on Etsy. They sell patterns for just about everything Tudor. To purchase or create your own accessories check out The Tudor Shoppe, or The Renaissance Tailor (for patterns) or Farthingales Corset Making Supplies. There are many online places to buy! My next Tudor post will include corsets, jewelry, shoes and other Tudor sytle accessories.